Whole Energy Solar is about Sustainable Energy. We began in 2002 with the completion of a solar model home using state-of-the art solar electric, solar hot water and space heating, solar snow melt and especially passive solar design (the latter accomplished by passive solar designer extraordinaire Rebecca F. Bundy, Design for Sustainable Living, LLC). For six years now we have been evangelizing and extolling on the virtues of clean, renewable, distributed energy. We’ve been fortunate to realize a number of exciting and attractive projects. Have a look at a selection of our designs under Projects—we hope the example set by these progressive home and business owners will inspire others to a more sustainable future. Morgan is President and co-founder of Whole Energy Solar, LLC. Morgan has a B.S. in Electrical Engineering from the University of Washington, is a member of IEEE, the Institute of Electrical and Electronic Engineers and he is a U.S. Green Building Council LEED Accredited Professional. 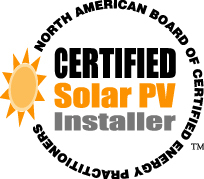 Whole Energy Solar’s founding principals were among the first batch of 50 installers nationally and the first two in the state to become NABCEP™ (North American Board of Certified Energy Practicioners) Certified Solar PV Installers in 2004. Morgan has a variety of management experience having spent the first part of his career in telecommunications (Siemens, AG), software (Microsoft, Visio) in Europe, Seattle and Silicon Valley. Morgan was a principal founder and organizer of the Sun Valley Sustainability Conference and he has experience consulting on sustainability issues for developers and local government. Morgan is particularly interested in working with progressive, green-minded developers of resorts and communities who see the opportunity to provide better products through comprehensive sustainable energy and sustainable water strategies. Morgan is also president of Whole Energy Solar’s sister company Whole Water Systems, LLC which focuses on sustainable water solutions. Peter is Whole Energy Solar’s lead designer and installer. He has been a NABCEP Certified Solar PV Installer since its inception in 2004. Peter has been living with solar energy for over a decade and has a keen appetite for the technology and quality installations. His background as a fine carpenter is apparent in the detail and quality of the installations he supervises. Before joining Morgan with Sun Valley Solar, Peter completed training on solar technology at Solar Energy International, in Carbondale, CO—the leading solar training institute in the country. Whole Water Systems designs sustainable water treatment and reuse systems for residential, commercial and community development projects. Using the latest technology in onsite treatment and constructed wetlands, Whole Water designs natural wastewater and storm water systems. Developers realize cost, marketing and entitlement benefits through decentralized solutions with natural biological purification and superior levels of tertiary treatment. Treated wastewater can be reused for landscape irrigation or recharging of the local watershed with purified water. Together with BioNova, their European partner, Whole Water is also bringing chemical-free natural swimming pool technology to exceptional projects in the U.S.